Note: You can enter this giveaway two (2) times per e-mail address per day. Deadline is 11:59PM ET 2.12.19. 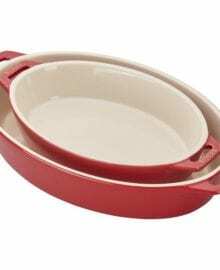 Great gratins, marvelous mac-n-cheese, and remarkable roasted meats are just a few of the things you’ll be able to make in the Staub Ceramic Oval Baking Dish Set. This set goes easily from freezer to oven to table and the porcelain enamel glaze ensures everything turns out moist and delicious. It is deep enough for raosting vegetables and also makes an amazing crisp Peach Cobbler. The more you use these pans the more you’ll love them, especially when you make this Butternut Squash Gratin. Yum! NO PURCHASE NECESSARY TO ENTER OR WIN. Void where prohibited by law. Open to legal residents of the 50 U.S., D.C. and Canada (excluding Quebec) who are at least eighteen years old at the time of entry and have internet access. Begins on 12.18.18 at 12:00:00 a.m. ET and ends on 2.12.19 at 11:59:59 p.m. ET. To enter the giveaway, submit your full name and email address on this form. Odds of winning this giveaway depend on the total number of eligible entries received. Only two (2) entries per email address per day. Sponsored by Leite’s Culinaria, Inc. For more information, visit our Official Rules. Be sure to add giveaways@leitesculinaria.com to ensure notification if you are the winner.